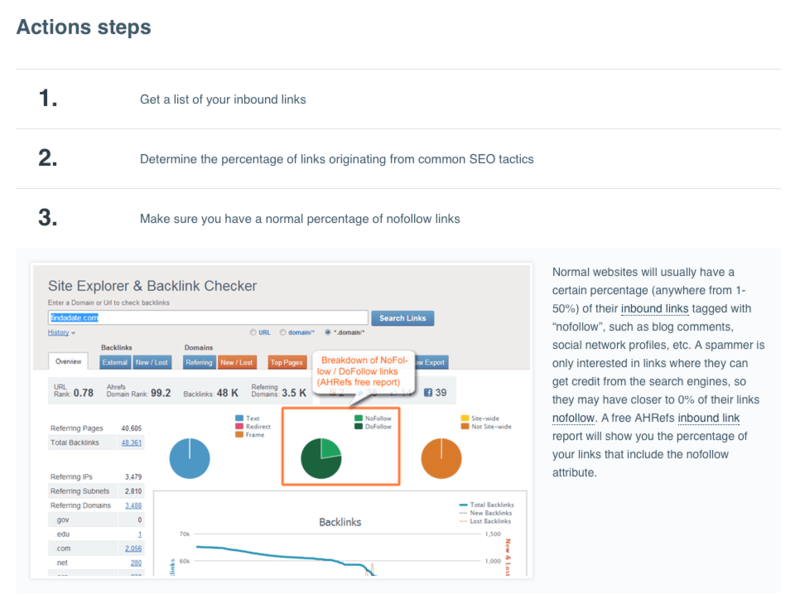 CanIRank is a newly-launched SEO tool designed to help you identify low-competition keywords, and grow your traffic with the least amount of link-building and SEO work necessary. CanIRank offers a number of useful features such as rank tracking, link building opportunities, on-page SEO suggestions, and a whole lot more which you can read about here. Using modern data analytics, CanIRank analyzes the net to define all the variables which really will bring you to high rankings. However, for this review I’m going to focus on using CanIRank’s powerful competitive analysis features to uncover profitable niches where even a small website can successfully rank. Wait, Aren’t Niche Sites Dead? It certainly has become a lot more difficult for niche websites and blogs to rank well in the past few years following Google’s quadruple-threat of increased reliance on domain authority, Panda, Penguin, and the EMD update. Passive income isn’t really passive if we have to spend dozens of hours building links, schmoozing on social networks, and begging for guest posts every time we build a new site. Besides, I don’t know about you, but I got into niche site building because I loved writing about my hobbies and interests and sharing knowledge with others, not to spend endless hours on tedious link building. 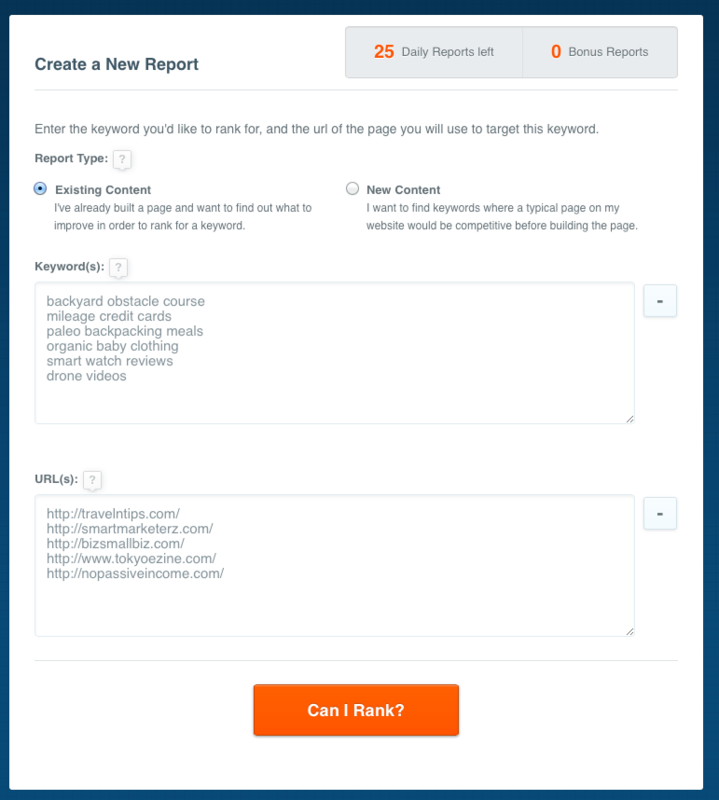 Enter CanIRank, quite possibly the most advanced keyword difficulty tool we’ve ever seen. Built by 3 Stanford engineers and one of the country’s leading data miners, CanIRank says their raison d’être is helping small businesses and bloggers compete against the megasites like Amazon, Wikipedia, Yelp, and About.com that seem to dominate nearly every search result these days. So, how do they do that? First, by calculating your website’s Ranking Probability for any keyword you’re considering. Ranking Probability is a new kind of keyword difficulty metric that is specific to your website, which the company says is over twice as accurate as other keyword difficulty tools like Moz, Market Samurai, or Long Tail Pro. Next, CanIRank collects over 200 data points for every competing URL. All the usual metrics are there, such as Moz’s Page Authority and Domain Authority, keyword usage in titles, headers, and body content, and number of links. But they also have some unique metrics, such as website relevancy, external relevancy (inbound anchor text), and usage of related terms. With all that competitive data, CanIRank can show you specifically where your website falls short, along with recommended changes you can make to improve your rankings. Great, so we have a highly-accurate keyword difficulty tool and a boatload of competitive data? How do we use that to find profitable niches? – Make a plan to dominate the niche! Would you be excited to write 20 or 30 posts on this topic? Can you think of at least 5 killer post ideas right off the top of your head? Is it something your friends are always asking you about? I’ve been watching a lot of American Ninja Warrior and thinking about building some of the obstacles myself, so I searched “backyard obstacle course”. My friend recently flew all the way to Australia in business class on miles he’d accumulated from credit cards, so entered “mileage credit cards”. I recently discovered that it’s super hard to eat paleo while camping or backpacking, so I thought “paleo backpacking meals” would be something others are looking for. Finally, “organic baby clothing”, “smart watch reviews”, and “drone videos” relate to hot topics that are growing quickly and I have a lot of interest in. 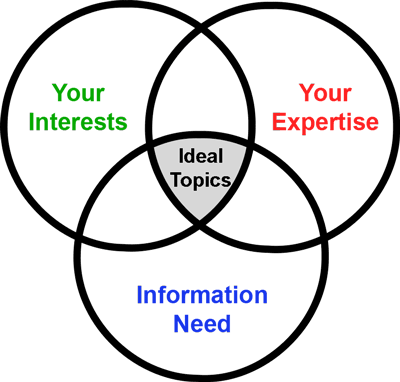 After entering all these potential topic ideas, CanIRank gives me a huge list of Keyword Ideas. It doesn’t matter if I’ve entered the most common term for each of these niches, CanIRank will automatically expand my list not just based upon the seed term I entered but also looking at keywords the competitors are targeting, terms the search engines consider related, and terms that are semantically related. 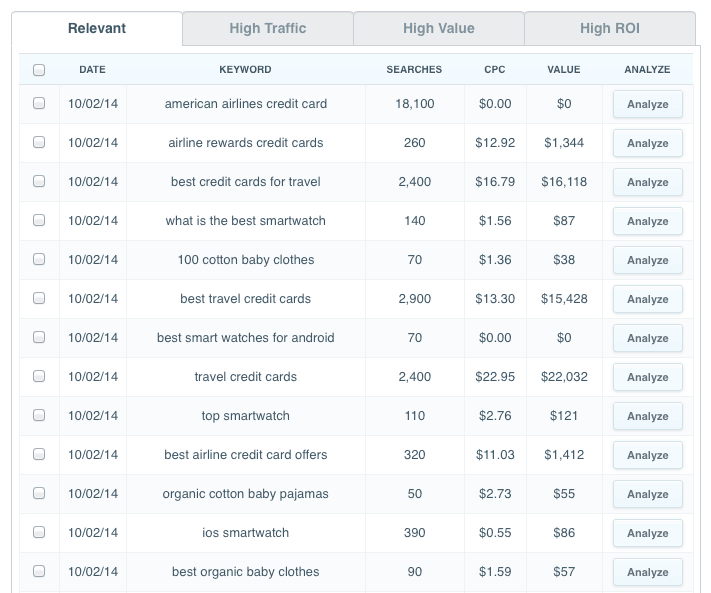 For each of those I can see search volume, CPC, and overall value. This saves a lot of time over other tools that just use seed terms, but so far it’s nothing revolutionary. The good stuff comes when we start analyzing those keywords, which is the next step. The first difference you’ll notice from other keyword difficulty tools is that CanIRank doesn’t just ask for a keyword, it also asks for a reference URL. The system uses your reference URL to compare to the existing rankers and determine if you’ll be able to rank. If you’ve already built your website, that’s no problem as you can just drop in a few URLs from your site. However, since we’re trying to identify profitable niches for sites we haven’t built yet, we don’t have a URL. Matt from CanIRank suggested using the URL of another niche site similar to the one we’re going to build, so I enter the URLs of a few other niche sites I own. Since I use a similar process to build out niche sites, if one of them is competitive for a keyword, chances are the others will be also. CanIRank calculates a Ranking Probability score for each website and keyword. I can see if I would be competitive with a site like my strongest niche site, one like my weakest niche site, or something in between. 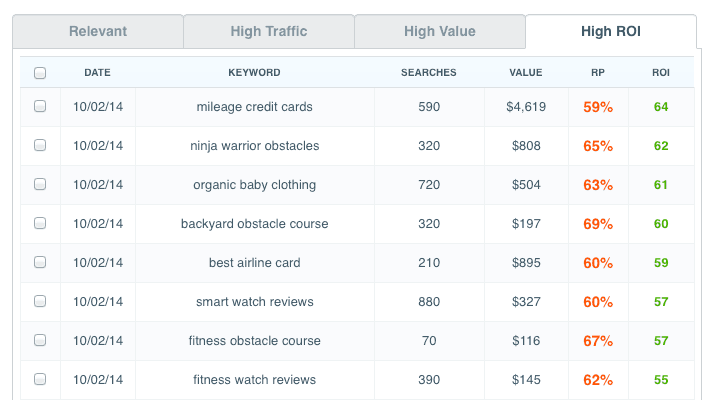 Finally — and this is where it gets really cool — CanIRank calculates a Keyword ROI score to show me which keywords offer the best balance between value potential and ranking difficulty. “Mileage credit cards” looks promising, but my Ranking Probability score is just too low — 58% means I’d need to make a much stronger site than my current ones in order to rank (a site with a good chance at ranking will usually score in the 80s or 90s). Scrolling down to the Competitive Analysis table, it’s easy to see why: every site has solid Website Strength (over 10,000 links! ), they’re doing a good job targeting the keyword, and even have lots of keyword-rich external links. That’s going to be tough to match! Instead, I click on the “Too Hard?” button to get CanIRank’s suggestions for easier keywords. I still like the paleo backpacking meals, but clearly $9/ month is just too low value. So I click on the “Too Easy” button to get suggestions for related terms that are higher value. This helps me find “paleo camping food”, “homemade backpacking food”, and “DIY backpacking food”, which all have more searches and advertisers. Now that I’ve narrowed things down a bit, it’s time to take a deeper look at the competitive landscape so that I can see what it will take to rank a new site in my chosen niche. Let’s look at “paleo camping food”, which CanIRank says I will have the easiest time ranking for. This looks encouraging! 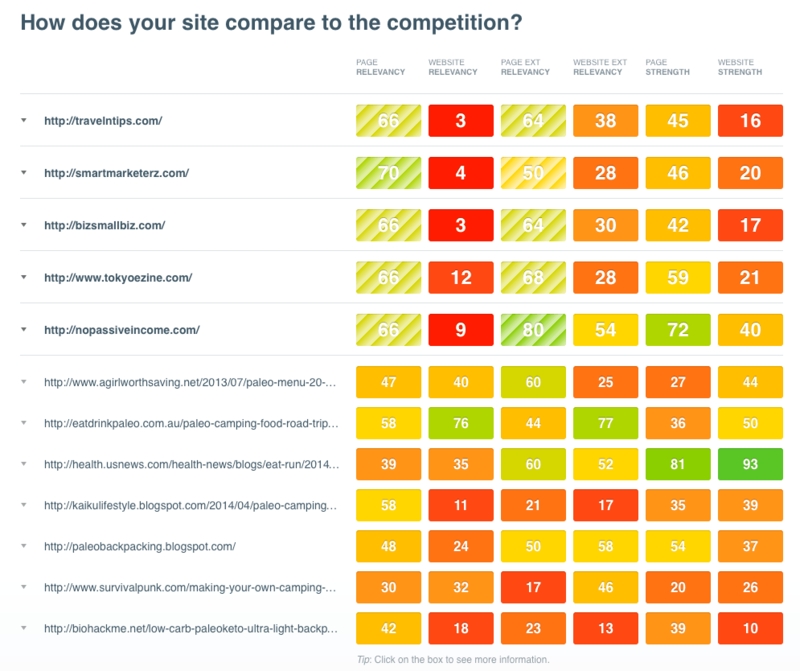 Lots of orange and red boxes (low scores) means that the current top ranking sites aren’t particularly strong. There’s even one website ranking with a Website Strength of 10, weaker than even my smallest niche site! The only big brand is USNews.com (with a whopping Website Strength of 93), but their article isn’t very well targeted — Page Relevancy is only 39. These are fairly relevant anchor texts, but all but one are from internal links— that’s easy to match! How about the highest-scoring Page Relevancy? Lots of content, but the keyword only appears partially in the title, and out of order in the body content. I could do a better job with Page Relevancy simply by including the keyword in my title tag, and using the exact keyword once or twice in my body content. 100 crappy links is all it takes to match Biohackme.net’s Website Strength, and Paleobackpacking.blogspot.com is only slightly better with 221 links. Both of them have very low MozRank and Page Authority. Step 4 : Make a Plan to Dominate the Niche! 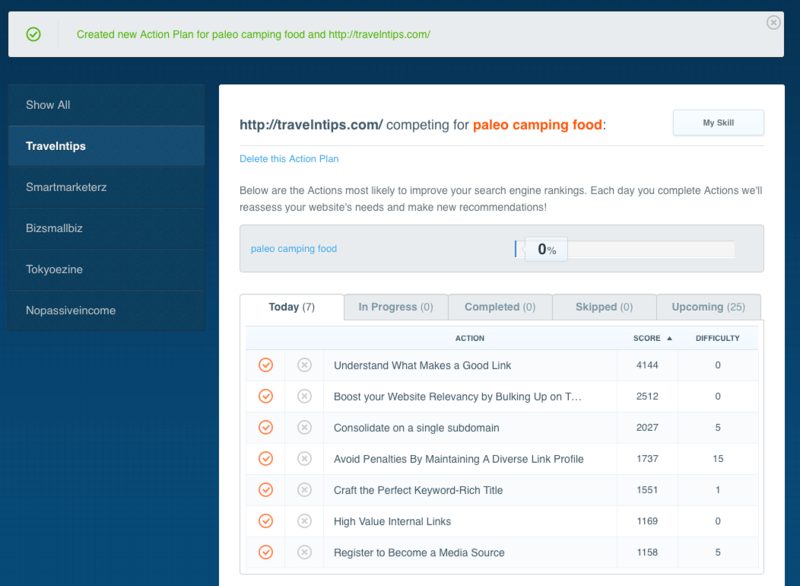 I now have a pretty good idea that I’ll be able to rank a website about “paleo camping food” if I do a good job targeting the keyword, get a few relevant anchor texts, and build a small number of quality links. That’s easy enough to do, but wouldn’t it be better if I could just outsource the process? CanIRank offers a cool feature than can help with that too. Just click on “Build Action Plan” and CanIRank will generate Action Recommendations with instructions for making the improvements necessary to rank. Most of the Action Recommendations are fairly standard SEO advice, but it’s nice to have them tailored to the specific needs of your website. However, I find them particularly useful for outsourcing: passing on your Action Plan to an outsourcer reduces a lot of the training and management burden because all of the instructions are right there in one place, easy to follow, and with references and examples for every Action. What I particularly loved is that unlike other SEO software, which will flood you with a large amount of data (most of it understandable only to SEO experts), CanIRank gives you just a number of important details to use through a series of actions to improve your ranking (and fight against the BIG of this online game). CanIRank is accessible even to those bloggers with less SEO expertise. For each of your report, you will receive a number of suggestions to put into practice every day until you’ll reach your goals. This SEO tool is the solution to help you find highly profitable keywords and create niche sites accordingly to make money online. But wait, there are many more benefits of CanIRank! You can use it to track your websites ranking (and improve them), find link building opportunities, get SEO suggestions (you will be informed of what exactly you need to fix without having the risk to be penalized for aggressive SEO) and more. I strongly suggest you to start your free trial today and unleash the power of this amazing tool. Have you ever heard about CanIRank? Have you already done a test? Please share your feedbacks and thoughts in the comments below, thanks! Thank you for introducing me to CanlRank! What a fantastic platform to be on. You have explained it so well and it makes a lot of sense. I’m not an expert of SEO, but I can see where it can benefit me and people like me. I may go over and give this one a try! Of course, I will share this with all of my friends. I do believe they will be excited about this one! you said you are not a SEO expert, me neither! That’s why I loved CanIRank, it’s approachable even to those bloggers who have not a huge SEO expertise. Thanks for sharing the content, Donna. Canirank is a great SEO tools i used till now it helped my clients to decide their niche by adding some keywords in it and boom! it brings their answer. Glad you enjoyed the review of CanIRank, Suprabhat. This sounds like a neat little tool, I had not heard of before. Yes, you should try it, Catherine. and it can be used for different purposes. I tried to find sharing buttons to share this post, Erik, but failed. Do you have any? Am I blind? it’s strange they did not show up for you! 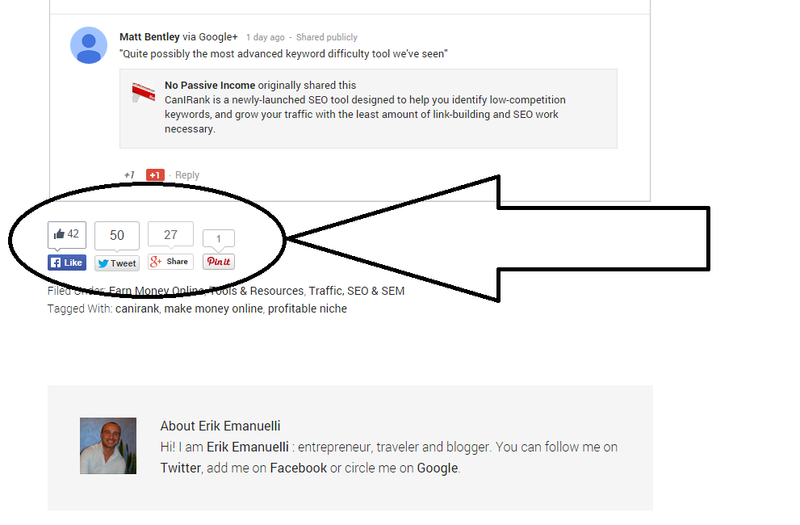 Sharing buttons are just below Google+ comments, and above my author bio and WordPress comments. Found the word “Tweet” and the Pin It button, but none of the others are showing up. I think it’s my Chrome browser. It’s done this before. Thanks for your reply, Lorraine. I guess it is an issue with your browser Chrome. Have you tried to simply flush the cache of the broswer? Wow what a tool and thanks for recommending it dude! I have recently started blogging again but I make my money asa website designer and developer. Naturally I want to rank for website designers or developers in Birmingham UK. which at the moment I am not. So I assume this tool is good for those wanting to rank in local areas like my home city. I even searched for my local town of Sutton Coldfield and am not even ranking there yet! I just assume that my site is just too new but hey time will tell! Awesome post and an awesome blog you got here Erik, I will deffo be back for more. I’ve just visited your site. Congratulations for your work, great testimonial from my friend Ryan. glad you enjoyed the CanIRank tool. You should give it a try, when you sign up there is a free trial available. I am sure it can help you rank for your desired keywords. have an awesome rest of this week! I am still not fully happy with it yet, my logo could do with improving and the background needs to change however I am happy with the layout and page speed of it ( >2 sec ) so thats all good! Ah that testimonial off Ryan, yea I have to have that pride of place on there! could not believe it when he made that for me! The guy truly is a legend in my eyes! Been working with him for over a year now and could not ask for a better client or friend! Thanks again for sharing this and will deffo be trying it out when i get back home. Till next time Erik. Stay Cool. I am a fan of white color as background, but with yours, your site shows personality! Congratulations for the loading speed, less than 2 seconds is really good! Nice review of CanIRank. It has amazing features such as rank tracking, link building opportunities, on-page SEO suggestions, and even lot more as you described here. It looks very beneficial for all of us as we blogger’s schedules are very busy. It is really a time saving tool. I would surely try this one. Thanks for introducing with us. Have a nice day ahead! Glad you enjoyed this review, Nisha. CanIRank is really an interesting tool for every bloggers, from new to more experts. Thanks for taking the time to read and comment here! Have an awesome rest of the week. CanlRank sounds like a real promising tool geared towards helping you make better choices of keywords. From this process, it reminds me of the SEOpressor which guides to make sure your blog posts are SEO compliant. I’ve been using the keyword planner but it seems like it’s not enough. I may have to look further into CanIRank! Thanks for this introduction! Have a great rest of the week! a pleasure to see you here! Thanks for taking the time to read and review this post. I find CanIRank a really interesting tool, with a lot of power. It’s even accessible to the less SEO experts. I suggest you to give it a free try. Thanks for sharing and for leaving your comment! I’m noting all my buddies posting here….cool! Super clear and helpful review. Dominating a niche is the way to go because going toooooo broad makes your job tough as hell. Why go against more folks when you can simply be for a small niche, learning it inside out, targeting this niche and serving your ideal readers and customers better than anybody else out there? It really is a no brainer if you want to do things intelligently. Thanks so much, tweeting soon, and signing off from Fiji! glad you enjoyed the review of CanIRank. It may look as a complicated tool, but it’s simple and accessible, even to the less experienced people. Thanks for the kind words, Ryan. I feel the same for you. May be because we share our huge love for travels and also the character. You transmit joy and positivity! it’s always a pleasure to “talk” to you. Have a great day in Savusavu, my friend. I think I must give a try to check the difficulty levels of my keywords. What’s its pricing? glad you enjoyed CanIRank guide. There are listed benefits, features and prices. There is also a 50% discount at the moment, while joining the beta. Just heard about new keyword research tool. As, looking to the review here, it seems that it can be a right choice to get ideas about relevant keywords. Thanks for sharing such a nice information about new Keyword Research tools. Glad you liked the review of CanIRank. very informative and educative content. Thanks for sharing it .. Thank you for introducing me to CanlRank! What’s a great tool. You have described it clearly. I’m new in Digital Marketing, I may go over try this one time!